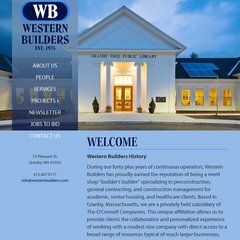 www.Westernbuilders.com - Western Builders Inc. Topics: Multi-residential, Commercial, Retail, Educational, and Current Projects. 164 users visit the site each day, each viewing 11.00 pages. Its 2 nameservers are ns2.fandotech.com, and ns1.fandotech.com. It is hosted by Tighe Bond (Massachusetts, Westfield,) using Microsoft-IIS/7 web server. The programming language environment is ASP.NET.